As Vilem Flusser states, writing is “a taking away, a de-structing. It is a gesture of making notes, of digging, of perforating. A penetrating gesture.” Writing upon the tablet illustrates Flusser’s concept of the subtraction of writing that penetrates the page, etching the words or symbols that imbued with social, political and economic values deemed important by cultural institutions. This type of Inscription is present when, as modern writers, we write with pencil upon paper, or use a typewriter that strikes the page. However writing with a computer alters this process, conflating the experience of writing and editing as many scholars have noted. 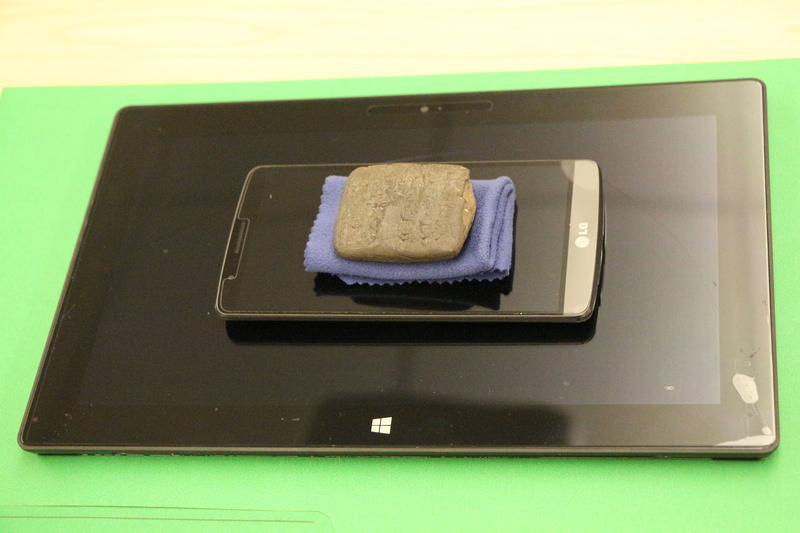 These tablets were easy to transport, as they are relatively light in comparison to other forms of engraving materials. Furthermore wet clay is malleable and can be shaped into this square shape form. 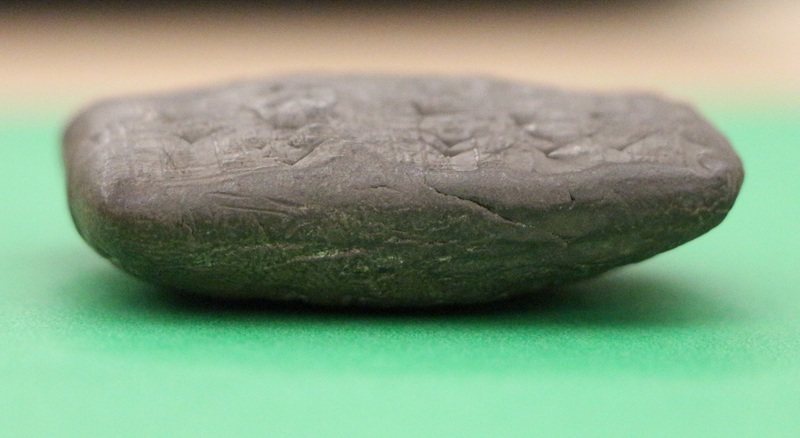 The edges of the material highlight this as the soft rounding illustrates the position and use of the scribes’ hands. The materiality of the object provides insight into the usage and storage of the object. 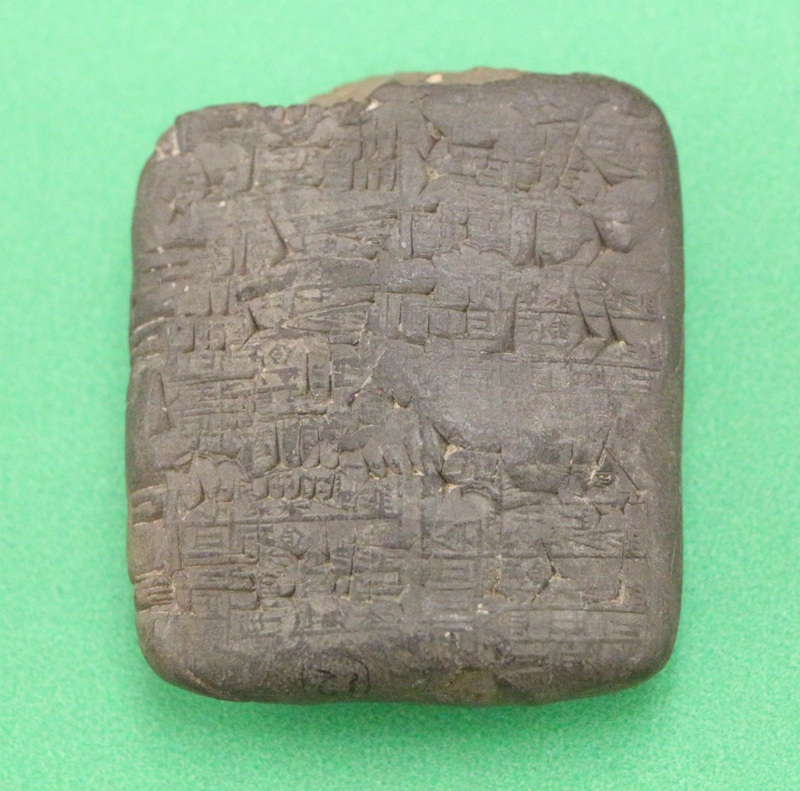 Portability is noted as one of the characteristics of the digital media by David Golumbia in The John Hopkins Guide to Digital Media, and thus exhibits one of the first connections between this cuneiform tablet and the modern incarnation of the tablet. Increase of portability allows greater access as well as increased economic value, as well as dissemination of discourse systems. As objects such as the tablet become more portable, writing systems are spread further and thus become more established. This portability is what enables the reproduction of new tablets or documents, from Mesopotamian tablets to Word documents that highlight the tendency to create facsimiles. The creation of facsimiles and circulation of tablets increased due to portability, therefore common conventions were needed. This illustrates the development of writing systems and notation, as well as social roles. Collaboration develops then from the collusion of appropriation of symbols and adaptability of tools. The thinness of the lines marks the precision and abilities of the scribe, who carefully studied these techniques, which were at this time, developed. This development process is represented by the interfaces of phones and tablets as the same exists for operating systems, which have shift to become more user friendly with the introduction of the GUI (Emerson). 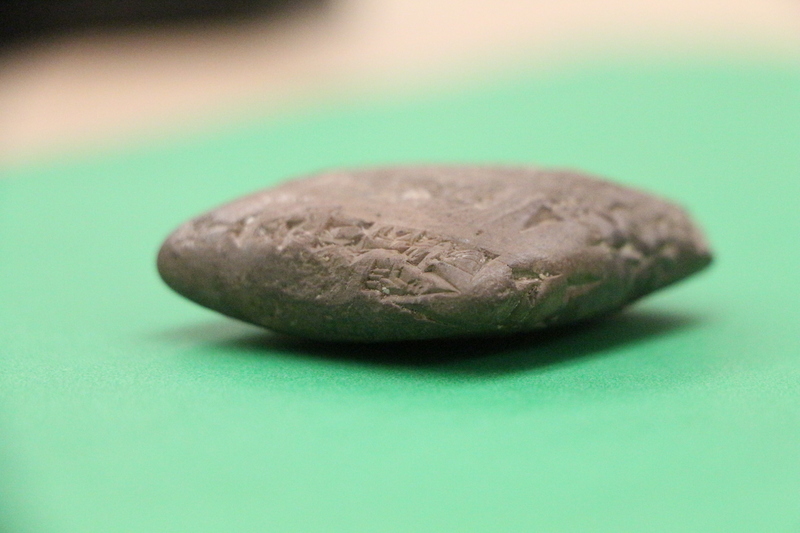 On the edge of the cuneiform tablet is King Amar-Suen’s seal, a symbol which was impressed into tablet to mark the ownership of the merchandise and political power of the pharaoh. This symbol functions as more than a simple tag, it reinforces power structures and illustrates the economic systems, working in a similar fashion to the way that brands mediate our experiences today. Similarly, Apple’s iPhones and Window’s Surfaces display their symbols, which are instantaneously recognizable to almost anyone. Brand logos exemplify our compliance to capitalism and embodiment of affect.